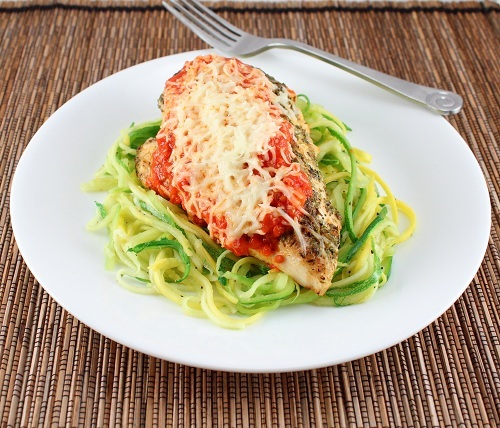 Chicken Parmesan is one of my favorite chicken dishes so I’m always looking for ways to reinvent the dish. I ended up grilling the chicken which is a lot easier than going through the hassle of “breading” the chicken. It tastes just as good! Now I made this before I started the Whole30 and I haven’t added any dairy since I finished. I just do not handle dairy very well so it’s best for me to stay away from it, but I had to share this recipe with those that still can enjoy dairy. If you are dairy free just leave out the cheese, that’s what I usually do and it’s delicious! Heat a skillet or grill pan over medium high heat with 1 Tbsp of oil. To make it easier to coat the chicken pulse the Italian seasoning in a spice grinder (optional). Mix together the seasoning and the Parmesan cheese. Grill (or sear) the chicken for 3-4 minutes per side. Place the chicken in a baking dish and top with marina and cheese. Cook for 10-15 minutes or until the chicken is cooked through and the cheese has melted. For no bake option, Grill the chicken until cooked through. Place a piece of foil on the grill under the chicken, top with marinara sauce and cheese. Cover the grill and cook until the cheese has melted. Served with zucchini and yellow squash noodles. To make the "noodles" I used a spiral slicer and sauteed the noodles (with a little bit of oil) for 2-4 minutes until the "noodles" were tender. Net Carb Count*: Low Carb Grilled Chicken Parmesan: 7 net carbs (for the entire Chicken Parmesan Recipe recipe) *Note carb counts are estimated based on the products I used. Check nutrition labels for accurate carb counts. Comments: The combination of Italian seasoning and parmesan cheese added lots of flavor to the chicken. The marinara helps keep the chicken moist and tender. This is definitely a must try!